St Pancras Old Church has been a site of Christian worship since the 4th century. It is thought that this church is on a site that has offered worship for more than 1700 years. Fragments of Roman material can still be seen here and there in the fabric of the current building. The monuments and reuse of stone chart the history of the church’s development over time. Spanning eight centuries since Fulcherius in the late 12th century the incumbents stretch down to the present day, Fr James Elston becoming the Team Vicar in 2012. Our project aims to recover some of this 1600 years of history through archival and scholarly research, as well as building on the collective memory of a thousand years of parishioners and visitors to St Pancras. We hope that some of you reading this blog might have your own memories or family history to contribute, and we welcome stories, photos and whatever else you might have to share. My understanding is that this site specifically inspired Blake to write his poem Jerusalem. The myth is that when Jesus was a youth and before his ministry began he travelled out from Alexandria with his Uncle Joseph, who was a metal trader. Two places in England they went to were firstly Glastonbury in Somerset that still boasts Joseph’s thorn and where tin was traded from the Mendips and secondly London. The metal trading wharves in London were on the Thames where Blackfriars is now. Next to these wharves was the river Fleet. At the highest navigable point up the Fleet was St Pancras where there was a pre-existing spiritual site that Jesus, being interested in these things visited. Blake, who lived close by in London for most of his life, knew of this myth and created his most famous poem around it, also creating what has been called the second English National Anthem. There are many confirmations of this in the imagery in the poem, most notably the “ dark satanic mills” which refer to all the grain mills around the site when Blake was alive, situated on Granary St and Granary Square amongst others. Blake was also an admirer and collaborator with Mary Wolstoncraft, illustrating some of her books. If you want to raise money to rebuild the church it would seem sensible to make the most of the story which could have a lot of resonance across the world. Thank you so much for that insight, we will chase it up and do something with it I’m sure! There is so much history to explore! Firstly – I was pleased to note that, on this week’s University Challenge, there was a round of questions on St Pancras Churchyard. Secondly – I am born and bred in Liverpool, but have family history associated with St Pancras Old Church and would like to share some of the research I have made into the life of my Great Great Grandmother Sarah Hawkins nee Austing: Sarah Austing was born in St Pancras on 11th September 1809 and was baptised in St Pancras Old Church some six weeks later on 22 October. She was the daughter of William and Hannah Austing and she had two brothers – William and John. Her mother Hannah died in 1836 and her funeral took place at St Pancras Parish Chapel on 3 July that year. The following year, on 16 December at a joint wedding at St Pancras Parish Chapel, Sarah married Francis Hawkins, and her father William married his second wife Sarah Elizabeth Hardy. In 1841Francis Hawkins was working as a Mathematical Instrument Maker and he and Sarah were living in Smith Street, St Pancras with their two sons Francis and Thomas. In 1851 the family had moved to 20 Wilstead Street, St Pancras, Francis junior was now living with his grandparents, but Thomas remained, together with a daughter, Emma and my Great Grandfather Frederick. In 1861 the family had relocated again and were now in Middlesex Street, St Pancras. Francis was now listed in the census as a Shop Owner. Frederick was now the only child still residing with Frederick and Sarah and at the age of 17, was working as a Pork Butcher. Francis died in St Pancras in 1877 and in 1881 Sarah was on her own, now living at 10 Popham Street in Islington and was working as a Laundress. Having outlived her husband and her four children, Sarah died in 1890 at the age of 80 in the St Pancras Workhouse and her funeral was held at St Pancras Parish Chapel. My wife, Brenda and I had the pleasure of visiting St Pancras Old Church last month and we were made very welcome and found out about several links to Liverpool which were a happy coincidence. Thank you so much for all of that! So interesting to hear about all the lives which intersect with our church. Do drop by again some time! As an added bit of information – I have now discovered that Smith Street, Middlesex Street and Wilstead Street no longer exist. Smith Street was demolished to make way for St Pancras Station, Middlesex Street became Purchase Street and Wilstead Street was absorbed into Ossulston Street. I wonder if you can throw any light on an item I bought at auction in Devon a few ago. It is a fire back, a metal plate designed to go behind a grate to protect the wall from the flames. On this is a cast iron parish boundary mark bearing the letters S P P M (St. Pancras Parish Middlesex). This measures 47 x 37 cm. It is mounted on a wrought iron plate which rather resembles an upside down portcullis measuring 65 x 61 cm. The boundary mark, which is dated 1871, has nothing on its lower part. However, two in situ boundary marks of this type have figures in cast numbers indicating the distance to the boundary on the lower part. One, bearing the same date is to be found on the west side of York Way, N.7., just north of the junction with Market Road, while the other, dated 1874, is on the west side of York Way near the junction with North Road. The fact that the mark on the fire back has no ‘distance figures’ would suggest it was specially cast for incorporation in the fire back. Could this have been made to go into a parish building such as the Vestry Hall built in 1847 which, I believe,was in use as a Roman Catholic Grammar School in 1863? Another possibility is that it came from either the Parish Work House, built in 1809 and later enlarged, or the Vicarage. It still has traces of soot on the surface. I would be grateful for any information or ideas regarding this item. I have been researching parish boundary and other marks for the last three years in preparation for a book on the subject, hence my interest. At one stage St. Pancras parish produced a booklet with all its boundary marks sketched and their position noted, and I was wondering if you had a copy of this or knew where one was located, and whether it would be possible to get a photocopy of this. Thanks for writing! This all sounds very fascinating. I’ve sent it around to some of the other members of the group, and I’m afraid little has come from it, but we’ll keep pondering. Not sure about the booklet you refer to. Worth noting that all our records are held at the London Metropolitan Archives – some digging there might produce some results. In addition, it could be that it refers to the other St Pancras, and it might be worth contacting them. I’ll let you know if anything else surfaces. Thanks so much! I’ve just been doing a bit of amateur genealogy. It appears that my great, great, grandfather was Rev James Carter Rendell, who was reverend in the1910s and 20s I believe. Which blows my mind somewhat, given that I managed Camley Street Natural Park from 2006-2009 without being aware of this! A lovely parallel – happy to contribute a small piece if you are interested. Thanks so much for getting in touch, an exciting discovery indeed! I’ve found your ancestor on british history online http://www.british-history.ac.uk/report.aspx?compid=64876#s1. It appears he was pastor from 1912 to 1926; an exciting (and topical) period of history to say the least! We would most certainly welcome a contribution on the topics. Please do pop by the church anytime as well! St. Pancras Old Church was the place of worship for many of my ancestors, so I was thrilled to find it and explore the interior on a recent stopover in London. My grandmother Ada Sharp was baptized at St. Pancras in 1895 and her parents Charles Sharp and Annie Pennington were married there a year earlier. My great-grandmother Annie Emily Pennington was baptized there in 1866 when the family lived in Chapel Grove. Her father Charles Pennington was a coal porter living Chalton Street when he married Mary Ann Wright at St. Pancras Chapel in 1865. Mary Ann had been baptized there in 1843 and her parents William Wright and Mary Ann Reed were married at St. Pancras Chapel in 1839. I haven’t researched the family history further back as yet, but the Sharp family resided in Ossulston Street and then Frideswide Place until it was bombed in WWII. I purchased one of the booklets on the church history and found it very interesting. My third great-grandfather, William Franklin and his wife, Elizabeth Bannister, were married at St Pancras in 1814. I have seen the Bishop’s Transcript of the marriage. I will be coming to London on the 21st from America, and I was wondering if the church has any additional records from that time period which have not been copied and indexed in the various on-line genealogy resources, i.e., membership rolls, list of church officers, etc. Great to hear from you! Is he any relation to the William Franklin who is buried in the churchyard? All of our records are held at the London Metropolitan Archives, so you’ll have to arrange with them to see any records related to your ancestors. I do hope you pop by the church, however! We’re open every day, and if you let us know in advance we may be able to arrange for someone to guide you around and answer any questions. I love this little church. I worked as a Speech and Language Therapist at St Pancras Hospital in the early 1990s and I often ate my lunch in the church yard. However unbeknown to me my great great great great Grandparents George and Elizabeth Nottridge’s were married at the church on Christmas Day in 1845. They lived in Little Clarendon Street in old Somers Town (now different road name). Which although could be pure coincidence but as a rather feral teenage (which we all were back then) growing up in North London, I’d often had reason to move in and around the area and always had a clear memory of doing so. Thanks so much for sharing your family history with us! Hope you find occasion to pop by again sometime soon. I was searching for information on this Church and happened to come across your post. George Nottridge and Elizabeth (maiden name Rutherford) were also my great x 3 grand parents!! What line do you come from? Have you managed to get any further back on Elizabeth, I’m stuck on her! Would be great to hear from a distant cousin! This is another Rachael . I worked at the hospital on the Nursing side during the time you mentioned. I have stayed in the area and for my sins am now a Churchwarden at St Pancras Old Church. I am often in the Church doing jobs and hear many family history stories. Thanks for getting in touch with us. If you and the Rachel who share the family history want a family reunion at the Church I would be happy to do a tour with tea and biscuits. Hi I am Patricia, Geraldine’s sister and I have been researching the family at Saint Pancras. The branch I believe we come from was through Elizabeth Rutherford’s marriage to George The branch I believe we come from was through Elizabeth Rutherford’s marriage to George Nottridge. One of their children was Emily and she married Joseph Johnson, from Devon and moved to Battersea. Elizabeth Nottridge and one of her sons William also moved with the family. I think it probably was because of the slum clearances in Somers town at the time. One of a number of clearances due to the ra also moved with the family. I think it probably was because of the slum clearances in Somers town at the time. One of a number of clearances due to the railways expansion. The Johnson’s later became the shepherds I don’t know the reason for this name change and my grandmother Ethel Minnie was Joseph and Emily’s granddaughter. hope this helps. My grandmother, Harriet-Jane Swain, was a nurse at St Pancras Hospital in the first decade of the 1900’s, where she is said to have fallen in love with a surgeon from a noble family. When she fell pregnant, he heartlessly abandoned her and according to family, he fled to “The Colonies”. My mother was given up for adoption and Harriet-Jane went on to marry a London banker, who was devoted to her and they were very happy,even though they could never have children. Fate can be very cruel, can’t it? The surgeon? One can only guess at his name: Harriet named my mother DOROTHEA LOIS HAWKINS SWAIN. Does anyone know of a Hawkins surgeon at St Pancras Hospital around 1905-1908?Who can help? The puzzle deepens… is there really nowhere I can verify that there was a Dr Hawkins at StPancrass around1908? Surely there must be records of that year somewhere? Have you tried the London Met Archives? If you have access to Ancestry (possibly via a public library) you can search UK Medical Registers for 1903, 1907 and 1911 and look for a Dr Hawkins who changed his address from London to elsewhere. Wow! Thank you Richard… Will do . Will go try asap, but the crux of the matter is, I need to know where he changed it to… my mother told me it was “to one of the colonies”. Did you see which one? Thanks again. I am in South Africa with limited resources to my disposal, unfortunately. Sir Rufane Shaw Donkin GCH KCB FRS FRGS (1772 – 1 May 1841), was a British army officer of the Napoleonic era, the governor at the Cape from 1820-21. and later a Member of Parliament. He named Port Elizabeth in South Africa after his wife who had died in India. He was buried here in 1841 along with an urn containing the heart of his first wife. His two sisters Jane Anna Donkin and Laetitia Donkin are also understood to be buried here. When St Pancras station was built their graves were moved, and the original locations are now covered with an embankment. There is a memorial to Laetitia at St Mary Redcliffe, Bristol whihc was placed their by her siblings. I am researching my family history and many of my family have been christened and married at Old St Pancras, including my parents back in 1961. From speaking to my mum it seems my great grandfather and his brother, Samuel and Maurice Moore who manufactured wrought iron replaced or repaired the gates and wondered if there would be any records of this, it would have been late 19th, early 20th century. Thanks for getting in touch. I’ve put our parish historians on the case, and this is what they’ve come up with. Inaugurated on 15th July 1891 by Nathan Robinson LCC and Frederick Purchase – Churchwardens. There is a Purchase memorial in the Gardens. 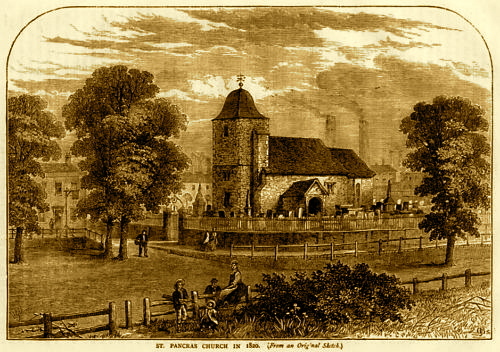 I am also researching my family history and have found that my 3x grt grandmother was baptised at Saint Pancras, London, England, (Independent Church, Tonbridge Chapel, New Road). I am confused with the name of the church as sometimes it appears as just Saint Pancras and at other times as above. Have I got the right church? What and where was St Pancras CHAPEL (burial in 1896)? I know it will sound strange but ok : So I had weird dreams about this Chapel. I NEVER saw it until now but I actually dreamed of it!!! A lots of times. And just discovered it. Can someone please help me?!? I don’t understand why!! Just please!!! My input into this site is completely different to other contributors. I am reading some history of ‘Quickmatch’ which was one of the Q Class destroyers built under the emergency program during WWll. The book is written in diary format and is extremely interesting for anyone who may have family involved. The ship was manned by crew from the Royal Australian Navy. My father in law was one of the crew. In March 1942 Quickmatch was officially adopted by the Borough of Saint Pancras. The Borough took a very real interest in the ship and contributed hundreds of books for the crew. The ship’s crew was also presented with a plaque by the Mayor of St Pancras on behalf of the citizens of St Pancras. The notes in the book which refer to the Borough of St Pancras range from 21 September 1942 to 15 January 1944. We will be in London (travelling from Western Australia) in July of this year and will make a point of visiting the Church. I will continue to research and see what else I can turn up – perhaps the name of the Mayor of the day. I have discovered that several of my ancestors were baptised and buried at Old St Pancras in the eighteenth century…..notably one Anthony Pairon Cousein, who was staymaker to Queen Anne, and was buried in a family vault there in 1749. I would love to know if anything of the family vault still remains. Thanks for writing. All of our records are in the London Metropolitan Archives. They may be able to help you there. Best of luck! I was born and raised in Los Angeles, but recently discovered that some of my ancestors were married in this church. Their last name was Pethrick– the couple had five daughters and moved to America sometime in the mid 1800’s. I am related to their daughter Jane. I am planning to visit sometime in the next year or so, and would love more information about this family or any long lost cousins I may have. Lovely to hear from you. All the records for the church are now held at the London Metropolitan Archives; you’d have to get in touch with them to trace any family history. We look forward to welcoming you for a visit any time! Hi I use to live with my parents in Medburn street a couple of streets away from old St Pancras Church. So it was such a privilege for me to get married there on the 5 September 1981. Dear Susan, thanks for contacting us at the time of your Wedding Anniversary, Congratulations. It would be lovely to see you . If you come on a Sunday after Mass 9.30 to 10.30 one of us may be able to get the Wedding Register out for you to see. We are from Melbourne Australia and have discovered Alfred Thomas Wilson my G G grandfather was Christened at St Pancras old church 6 Dec 1829. Fascinating history about this church. We are hoping to discover more about his parents, Thomas Wilson and Mary anne Winslow. Would you have a register of either the christening or even marriage of his parents? Lovely to hear from you! I’m afraid all records are held via the London Metropolitan Archive, so you might be able to write to them with your queries. Do let us know how it goes! I live in London presently, I am tracing family history, there are some indications that a daughter of the Dillon family married into our family in the 1650’s or so. In reading now I find many Dillon’s being buried at St. Pancras, Middlesex . It is extremely likely it was a Catholic Church and grace site. Their is a small chance that the fellow named Jacques Pierrre O’Flanagan ( James Peter ) , who I believe is a likely direct relation, may have been buried with the Dillon’s as he lived through and likely survived the ” terror” in Paris. He was a long standing Lietenant Colonel in the Dillon and a Knight and Courier of both Kings of France, a member of the diplomatic core and a later stage of his 49 year career was in the Ministry of Foreign Affairs and the Navy. The family served in the Dillon’s for 3 generations . There was such upheaval during the revolution that his birth church St.Elois in Rouen was desecrated in 1791-1792 and I have been unable to find a record for him. It is very possible he went to Newport and/or Philadelphia in the America’s. If he is not listed , he may have gone under another name , Jacques-Arthur , or last name fore instance Flahavan . Very interesting! I’m afraid all our records are house at the London Metropolitan Archive – perhaps they can assist you in your search? Let us know what it turns up! I think my great grandparents were married at St Pancras church in 1894 was the vicars surname Brookes at that time? we have at the Church . It goes back to the first recorded Priest -Fulcheris in the 12 Century. Lovely to read this blog – perhaps you could clarify something for me? My 3 x great grandfather was married at St Pancras in 1844. However I think this would be the New Church? Marriage Details say Parish Chapel, St Pancras. Paul is the surname of the clergyman. I am just a bit confused about the old church and the new church. Alessandro Maria Grimaldi was my 5th great grandfather and was buried at St Pancras Old Church 2nd June 1732. Below is a copy of his will (original can be seen) . If there is any more information you could give me I would be grateful, if not you may be interested in the details provided. and surrender (his own palace and two other palaces of the Grimaldis being destroyed) he was compelled with others by an edict of Louis to quit Genoa in 3 days. He emigrated to England in May 1684 and was an accomplished artist. In 1705 he married Dorcas the daughter and co-heiress of Henry Anderson esq. (son andheir of Sir Francis Anderson MP of Bradley Hall, Durham and Jesmond, Northumberland). Alexander died 28/5/1732 and was buried in St. Pancras, Middlesex. In the name of God Amen. I Alexander Grimaldi of the Parish of St Giles in the Fields in the county of Middlesex, Gentleman, being weak in Body but sound in mind, memory and understanding, I praise be to God for the same Do make this my last will and Testament in manner the following I that is to say principally I resign my soul into the hands of God my Creator trusting that through the meritorious death and passion of my Dear Redeemer Jesus Christ I shall obtain remission of my sins and inherit everlasting life and my body I comit to the Earth to be decently buried at the Discretion of my Executrix herein after named And as to such worldly Goods and effects herewith it shall please God to Bless me I give and dispose of the same as followeth. I give to my loving son Alexander Grimaldi the sume of one shilling to my Son Charles Grimaldi the sume of One shilling, to my daughter Elizabeth Carter the sume of one shilling and to my daughter Arabella Worlidge the sume of one shilling. All the rest and residue of my Goods, Chattels and Effects whatsoever reall and personall I give and bequeath unto my loving wife Dorcas Grimaldi whom I make Sole Executrix of this my Last Will and Testament hereby revoking and annulling all former wills and codicils of Wills by me at any time heretofore made In Witness whereof I here unto set my hand and seale the twenty ninth day of February One Thousand Seven Hundred and Thirty One. I was interested to read this information. In the London Daily Post of 4 November 1734 appeared the following advert: “Advertisement. All sorts of Mosaick Work upon Glass, on Cyphers, Coats of Arms, Frames for all sorts of Looking-Glasses, Altar-Pieces and Religious Pictures to take abroad, Histories on Snuff-Boxes, or Pictures to hang in Rooms, engrav’d in Gold or Silver; likewise all sorts of Drawing in History, Ornament, and Architecture; Cuts invented for Books, the Subjects being given. All Gentlemen, or others, may have their Original Paintings copied in Indian-Ink, or Black-Lead, in the most beautiful manner; likewise their Faces taken to the greatest Likeness; or Persons taught to Draw by Thomas Worlidge, Successor to the late Mr. Grimaldi, and Scholar to the late famous F. Boitard. He will attend any Person in an Hour at any time of the Day, after Notice left at the London Punch-House on Ludgate-Hill”. As you mentioned that your ancestor Grimaldi was an accomplished artist (do you have or know of any of his works? ), and as his daughter was called Arabella Worlidge, surely your ancestor is the same man that Thomas Worlidge mentioned in the advert? Thank you for your reply. Will respond in about a fortnight, on holiday in Africa at the moment wifi not very good and my notes are in UK. I was very excited to read that you are the 5th Great Granddaughter of Alessandro Maria Grimaldi. He is my 7th Great Grandfather. I hail from Alessandro’s Granddaughter Esther Grimaldi. My father researched the family tree many years ago and is still doing so. Of later years, I have been doing the same. As you would know, Esther’s brother Marquess William Grimaldi was a miniaturist artist. I own one of the enamels he painted in 1787. I was wondering which line of descent you hail from and do you own any of the family artwork. It was very interesting to see Alessandro’s last Will and Testament. I was very interested in your reply. My fifth great grandmother was a sister of William Grimaldi and I was not aware that he had anymore. Can you let me know the details of your line of descent ? I would love to see a picture of your enamel miniature and how you came by it, was it handed down in the family? I was very interested to hear you had one of William Grimaldi’s enamels. My fifth G Grandmother was Susanna Grimaldi, Williams sister. I had not realised that he had another sister called Esther, would be interested in the details. I have tried replying to you before but the replies seem to disappear! I appreciate you getting back to me. Fantastic that we have found each other and descend from the same line in the tree through Alexander, Alessandro’s son. Esther Grimaldi was born 1749 and died 1774. Our 6th Great Grandfather, Alexander married twice. ( firstly Mary Barton and then Esther Barton ) Between the two marriages, he had 9 girls and 6 boys. One of the girls, Esther, my 5th G Grandmother and Susanna, your 5th G Grandmother. My dad’s research is extensive and I have followed behind attempting to fill in some gaps for him; hence finding your posts here. I hope this is permissible through Joanne moderating this post, but I could furnish with you/exchange family details, and show you my enamel, including the story of how I have it in my possession. It appears my 3 x great grandparents, John and Sarah Byerley were married at the Old Church on Christmas Day 1852. At least two of their children were baptised there too in 1854 and 1888. I look forward to visiting you in the near future. Please can you tell me whether there was a bell in the church tower in 1798-1800 and, if so, whether it was used at that time? Many thanks! I was unable to locate it. Is there a map of individual graves? My ancestor was James Green 1782 – 19/02/1854 aged 72yrs. If anyone knows where the grave is I would be most grateful. Photo would be fantastic. My 3x great grand parents, Manasses McShane & Elizabeth Dennis, were married in St Pancras Old church in 1816. I would like to know the name of the priest who married them. Apologies for the delay in getting back to you — checking on it now! I am trying to trace the wedding certificate of my ancestor Christina Meyndrina Douglas who married William Sloper at St.Pancras church in in 1829.Do you have any record of this? Whilst researching my family history through my grandmother’s line (all Wagner by name) I have come across David Wagner (my 3rd great grandfather) who was married in the Old Church on Christmas Day, 1831. He and his wife, Susannah Lee, had their son, David Lee Wagner, baptised there November 4, 1832. They lived half-a-mile away in Cooks Row (no longer in existence) next to Councillor William Agar’s property. Was it usual/unusual for marriages to take place on Christmas Day? David’s father was the Reverend George Wagner (1764-1833) but I can find no connection of him with St Pancras Old Church. David was baptised at St Clement Danes, Westminster, so maybe the Reverend was located there. I just wondered whether there was a connection that you know of that meant George “pulled some strings” for a Christmas Day wedding. Their son, David Lee Wagner, also married in the church on September 29, 1857, to Eliza Skair Best. She died in childbirth with their 4th child and David remarried another “St Pancras girl”, Jessie Hollier/Hollyer, in 1864 although by this time the family had moved to West Ham. Hi, my ancestor John William Dalcho was married to Martha Williams in St Pancras Old Church on the 18th February 1797. I have been searching for Martha’s baptism records for approximately 1775-1780. Do you have a team that search the records at St Pancras Old Church for a fee? Lovely to hear from you, Danni. Unfortunately, none of the records are held at St Pancras anymore, but are at the London Metropolitan Archives. The good news is you will be able to get in touch with them, and they are likely to have the services you’re looking for. Best of luck! My grandmother Harriet Jane Swain was a nurse at St Pancras Hospital around 1909. Can anyone help me with an email address where I might enquire about her and other medical staff at the time? I would be so very grateful. Fascinating. I’ve passed the question on, and will let you know what comes back. It might be worth asking at the London Metropolitan Archives, and perhaps the Camden Council archives, who might also have some suggestions. Best of luck! My great-grandfather was baptized in December of 1859 at St. Pancras. The ceremony was performed by C.H. Andrews as written in the parish record book for that year. Am I right to assume C.H. Andrews was a rector or cleric at the parish during this period? We plan to visit St Pancras in September and experience this site as part of a family history tour. I just want to say how sincerely grateful I am for the discipline of careful handwriting in 19th century English records. As much as I have enjoyed finding my ancestors, and not always in happy situations, I have equally enjoyed observing how clearly and neatly clerks and pastors wrote down the census and church records. I’m equally impressed with the extent to which many records from institution and churches were stored carefully through the decades and are now available to family researchers. I am so thankful for the work of clerics and record keepers from those eras. I wish they could know how they have made it possible for us to know a little more about the stories of our ancestors. We look forward to visiting St Pancras soon, and we will also walk through the nearby neighborhoods where my great-grandfather and his family lived. With regards. Hi. I’m investigating a murder. Don’t worry though, it happened in 1771. The victim was my namesake and no doubt distant ancestor Sarah Orbell. She was killed in Fig Lane (now Crowndale Road) and was buried at St Pancras on 15 Feb 1771. I’m coming up to London next Monday to visit the locations recorded in the transcript of the trial of her murderer. Is the church likely to be open if I call by around lunchtime? Oh that sounds fascinating! Church is usually open every day, so that should be fine. I will pass your message on to the churchwarden in case someone can be around to talk to you. Hello, yes the Church should be open next Monday. If you have any further questions after visit please come back to us. I’m looking for informations on the St-Giles-in-the Fields chapel at the entrance to St Pancras Gardens. I’m looking for when it was destroyed and all informations . Thank you for your help. Recently I had a genealogical question on two ancestors married at St. Pancras, Middlesex, London on July 21, 1597. The spellings are (Knyvett) Dorothy Knvvet and Phillip Plumley. I’ve researched hard to see if she existed, many websites have false information. There is circumstantial evidence of her existence through her sons’ names, and dates. If there is any way to see if they were indeed married at St. Pancras it would help our efforts greatly. Beautiful history, and thank you kindly.